Both the Carbon Dinos and Emery Spartans took part in the 2018 Mr. Mac BYU Invitational on Friday and Saturday in Provo. Out of the 49, 1-3A teams that participated, Carbon Finished in 19th place while Emery took home 24th. Earning points for Carbon: Shannon Baker, third in 400 meters (pictured). Boys’ 4×100 team (Carson Frame, Jaylon Dennis, Carter Fausett and Derek Hillam), fifth place. 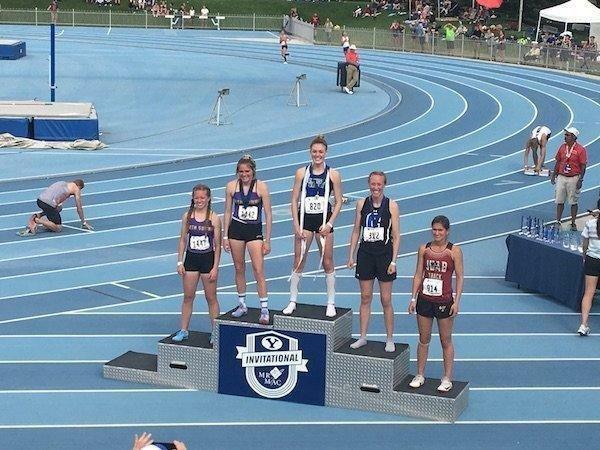 Makenna Blanc, eighth in 800 meters. Girls’ 4×400 team (Paiten Thomas, Madelyn Christensen, Makenna Blanc and Shannon Baker), fourth place. Boys’ 4×400 team (Jared Spendlove, Carson Frame, Carter Fausett and Derek Hillam), fifth place. Derek Hillam, sixth in 300-meter hurdles. Carson Frame, eighth in long jump. Emery secured points by standout performances by sophomore sprinter Braiden Ivie, who took second place in both the 100 and 200 meter races, respectively. The Carbon Dinos will host the Region 14 Championships on Wednesday and Thursday at Carbon High School. Emery will take part in the Region 15 Championships at Manti on Thursday.